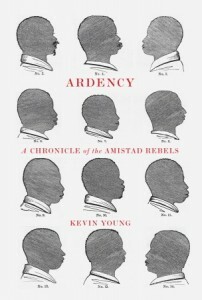 I got a hold of Kevin Young’s Ardency: A Chronicle of the Amistad Rebels when it was published back in February. I’ve been enjoying reading and re-reading. I’ve slowly been developing a short list of reasons that Ardency matters…to me. Here are 5 for now. ● extends the focus on slavery and struggles for liberation. From Dunbar and Hughes to Robert Hayden and Margaret Walker to Vievee Francis and Evie Shockley and so many more in between, African American poets have continually written about enslavement and quests for freedom. Years ago, Elizabeth Alexander wrote a series of poems based on the Amistad. Young’s book-length treatment of poems on the Amistad extends the practice of black poets writing continually about slavery. ● showcases the work of a skilled poet. The volume demonstrates Young’s ability to condense a large body of historical ideas into engaging episodic poems. His serious wordplay and his ability to mold a major historical event with all kinds of side stories into a fairly concise poetic narrative makes Ardency entertaining and informative. ● reveals the fruits of a poet’s research. Young’s attention to historical details and records reveals that he, like several other contemporary African American poets, draws on formal research in order to produce a large poetry project. Young acknowledges his debts to various literary and scholarly sources in the acknowledgement section of his book. Even the design of the title page gives a nod to some of the official historical documents. ● further solidifies a poet’s style. Throughout the volume, it’s clear that we’re reading the signature styling of Kevin Young. Over the years, he has honed and displayed a distinct approach to word choice, phrasing, lineation, and the employment of dashes. Yes, dashes. Young’s development and presentation of a signature style in his books over the years have been notable connective threads among his various works. ● addresses a single subject in a book. Young’s book focuses on the events related to the Amistad, which can make the book rewarding as a concentrated narrative. Of course, there's some value in volumes where poets cover various diverse topics. But there's also something (positive) to be said when we see a poet working through a single, big topic from different angles and developing a central character and several supporting figures, as Young does in Ardency.